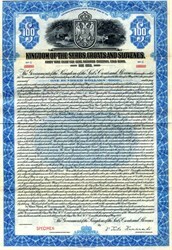 Beautiful specimen bond certificate from the Kingdom of the Serbs, Croats and Slovenes Bond of 1922. This historic document was printed by the American Bank Note Company and has an ornate border around it with a vignette of the Royal Seal with an scene of cattle at the river in the background. This item has the printed signature of the Minister of Finances and 89 years old. The Kingdom of Yugoslavia (Yugoslav, Latin script: Kraljevina Jugoslavija, Cyrillic script: ��������� ����������) was a state stretching from the Western Balkans to Central Europe which existed during the often-tumultuous interwar era of 1918�1941. It was formed in 1918 by the merger of the provisional State of Slovenes, Croats and Serbs, formed from territories of the defunct Austro-Hungarian Empire, with the formerly independent Kingdom of Serbia. The Kingdom of Montenegro united with Serbia just five days earlier, while the regions of Kosovo, Vojvodina and Macedonia were parts of Serbia prior to the unification. For its first eleven years of existence it was officially called Kingdom of Serbs, Croats and Slovenes, but the term Yugoslavia was its colloquial name from the very beginning. On 17 April 1941, Yugoslavia was occupied by Nazi Germany and was reorganised into four provinces under foreign rule; a royal government-in-exile, recognized by the United Kingdom and later by all the Allied powers, was established in London. In 1943, the new country called Democratic Federal Yugoslavia was proclaimed, and its capital was freed following the Belgrade Offensive. The King was formally deposed by the Constituent assembly on 29 November 1945.